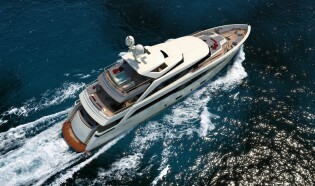 New Mondomarine SF40 Superyacht SERENITY to be displayed at MYS – Superyachts News, Luxury Yachts, Charter & Yachts for Sale. SF40 luxury yacht SERENITY provides deluxe accommodation in a gorgeous owner’s cabin on the main deck and four guest cabins, all positioned on the lower deck. The owner’s cabin features an unusual layout on two semi-levels: the upper part is fully immersed in the surroundings, with a panoramic open view to the fore, while the lower area is more intimate and private, with light coming from the top and from the sides, resulting in a relaxing and hideaway sense of this space. Each part of the SERENITY superyacht has been conceived both individually and in relation to the others so to provide a flow of aesthetical continuity and functionality, resulting in a harmoniously calibrated combination of elegant elements. The distinctively clean exterior as well as interior lines produce a timeless sense of luxury, with focus on the enjoyment of the ambient and on the rediscovery of the essence of travel, adventure, as well as discretion without any ostentation.